As far as flowering plants go, pollination is absolutely critical to the health of current and future generations. Pollination among plants allows for the creation of seeds, larger fruit, and increases genetic diversity, leading to a greater resistance to environmental stressors. In order to achieve the most efficient pollination possible, some plants have developed close relationships with specific animals. Agave plants produce flowers on tall stalks to lure in bats while fig trees rely on highly specialized wasps for pollination. The native bottle gentian, preferring bumble and carpenter bees over all others, possesses a flower with closed petals that most insects simply can’t open. Only those strong enough to pry open the petals are allowed the honor of pollinating such a regal bloom. By supporting certain pollinators over others, these plants are able to fine-tune their flower shape and bloom time in order to more easily attract the most efficient pollinators. Rhododendrons, azaleas, and mountain laurels take their pollinator pickiness to a whole new level. These plants actually produce powerful neurotoxins that appear in their nectar which actually harm or kill unwelcome diners. Rhododendrons seem to produce more than 25 types of these toxins, called grayanotoxins. The plants distribute these throughout their leaves in order to help ward off pests. Grayanotoxins are also found in their nectar and have been documented killing honey bees and other unwanted visitors. It is important to keep in mind that there are many different types of rhododendrons and many types of pollinators. While honey bees are rarely able to feed on American native rhododendrons, they have been known to actively collect and store nectar from rhododendrons native to the Mediterranean where honey bees also originated from. In heavy enough quantities, this honey can cause nausea and disorientation. There are several stories throughout ancient history of this honey being used, including a Roman army being tricked into eating their full and then ambushed while under its effects. Like other specialized plants, rhododendrons have designed their blooms to attract their favorite pollinators. Certain native bees like bumble bees and the azalea miner bee are immune to the toxins and happily feed on the nectar. The preference native rhododendrons have of these bees to the non-native honey bee is understandable- they are much more effective at pollination. The grayanotoxins present in rhododendron nectar raise another question. If their preferred pollinators disappeared, would the rhododendron unwittingly poison any alternative pollinator who tried to help as it declined as a species? Recent research in Ireland may be showing that this is not quite the case. Scientists there have been studying invasive Mediterranean rhododendrons in order to figure out how they are able to achieve proper pollination without their specialized native pollinators. Incredibly, it appears that these plants are able to detect when their pollination is in need of a boost and act accordingly. Studies have shown that these plants are able to slow or even stop the production of toxins in order to attract other pollinators- in short, if a plant is in its native range, it can afford to be more selective as its natural pollinators are around. 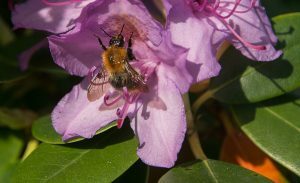 It seems that some rhododendrons are able to adapt quickly to changes in pollinator availability. In the grand scheme of things, specialized pollinator relationships are risky as the effectiveness of close relationships also binds the two organisms together. Without their specialized pollinators, some plants are unable to attract alternatives and ultimately decline. The same can be true for pollinators that cannot find the plants they need. When you’re thinking about what to plant this year, make sure to include plants that support the beneficial animals in your area. I have read several good stuff here. Definitely price bookmarking for revisiting. I surprise how a lot attempt you set to make such a fantastic informative web site. Wonderful to hear! Thank you so very much!